Gotta love a chance to talk that up. It struck me because it could be read in several ways, but ultimately, that its answer is followed by a YES, NO, and MAYBE? Are there normal Saints? Yes! – Many saints live very normal lives. Take a look at any Saint Calendar on a random day and you have the following- “Little is known about his life- He lived til the age of 37, He was Carmelite/Jesuit/a Farmer; Some saints do a darn good job of living a life of prayer, charity, and uneventual upkeep of the Kingdom, getting noticed JUST ENOUGH by someone at some point to get the big S.
Are there normal Saints? Well, No- In order to be declared a Saint you must show “a heroic level of virtue or suffered martyrdom”. Take a gander at any martyr story. St Lawrence, <of the Super Cheeky>- “Turn me over- I’m done on this side”? (Fun fact- Facing a Burning Death, I’m not this eloquent). I write this on the feast of St. Januarius, who was thrown to bears, my wife’s number one nemesis/fear. Less Bloody example, St John Vianney led a simple life, prayed his way into transforming his small French church into a pilgrimage site, holding confessions 16 hours a day, and reading souls. This list could go on forever. You know. How “normal” saints do. These examples are showy and inspiring and quite honestly, put my very normal, cush life to shame. Their lives are the foil to our FirstWorldProblems, eclipsing any issue with work copier that slows down your day (really, that awful, huh? I didn’t enjoy my flesh ripped to shreds by rabid animals). In our modern times, there are few examples of heroic virtue like this to be seen, reported on or otherwise, in first world society. Are there normal Saints? 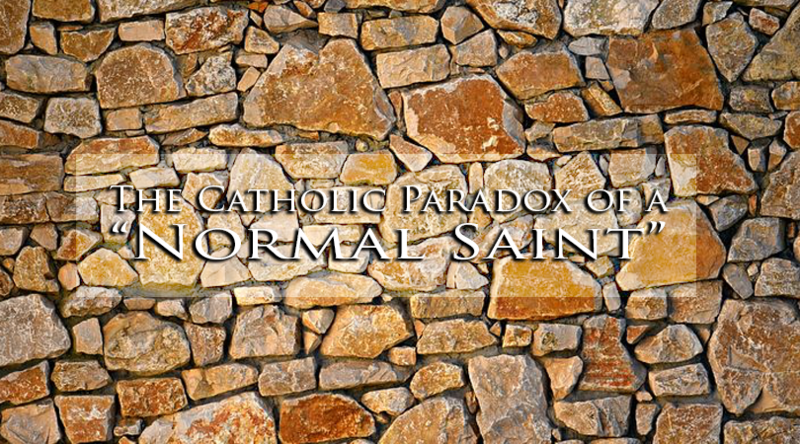 Maybe – I am not at expert on Saints and with a relative term like normal, I am sure someone could find a saint who lived, for the most part, a normal life while another critic would find it extraordinary. That a normal person is put into what becomes an extraordinary event. That an extraordinary person is put into an ordinary position maintains its “extra” as it were, but all how a person looks at it. So now that we have answered the question 3 ways, what do we really make of this? All the paradoxes in this verse and Praise God for it. God’s call for our lives is one of Heroic Virtue, a total resignation to His Will. It is both a “normal” reaction, in that your true self is a Christian Identity. It is also not normal because it is not seen in our every day and that it sometimes calls us to the extraordinary. Total resignation will literally take our lives anywhere and the Journey is paradoxically normal and most extraordinary. Neal is a husband, father of 2 and 1 on the way, Middle School religion teacher, Youth Minister, Faith Formation Coordinator, nerd, and sports enthusiast.